After the relative ease and comfort of my recent forays into doing stuff on my own, I decided I’d go one step bolder and go to the pictures. By myself. On a Friday night. I know, I know. It’s like I want to feel the thrill of self consciousness and anxiety. Couldn’t have picked a Tuesday morning could I? Had to be peak traffic. It was such a tremendous belly flop into the deep end that I’m sure I heard a splash when I walked into the cinema foyer. First of all, I hadn’t been to this particular cinema for a long time and it had all changed. They didn’t have ticket desks anymore. I was very confused. Some people seemed to be getting their tickets from machines and others buying them with their popcorn. It was like someone had built a time machine and sent me from the 1950s and I was all perplexed, waiting for an usherette to come round selling cigarettes from a tray and show me to my seat with a torch. I opted for one of the automated machines which a gaggle of youths (yes I said youths) had just vacated and after spilling everything from my pockets all over the floor including two Always Ultra Nighttimes and a little Postman Pat van, I managed to get myself a ticket to see Deadpool starting in two minutes’ time, and a rushed Diet Coke and popcorn. Alas my tiny hands were now full and I had to rely on passers by to open the door to Screen 3 for me so that I didn’t squeeze my drink all over myself. What came next I fully expect to haunt my dreams and lowest moments for the rest of my life. It was assumed that I was with the large group of “trendy teenagers” who had kindly held the door open for me – understandably, because who goes to a new film on their own on a Friday night? With my hands so full I couldn’t quite hand my ticket to the usher. So by way of explanation I tried to let him know I wasn’t with the crowd in front who by this time were all taking their seats, and needed to know where my seat was. Just at the precise moment that I said – in inexplicably the kind of tone and volume normally reserved for speaking English slowly and loudly to local people when on holiday – “I’m not with them…I’m on my own” the air conditioning randomly shut off, the house lights came on, and 67 people turned round to look at me. I am going to take a leap of faith here and assume it was just a spot of normal pre-film electrical maintenance and not the very infrastructure of the cinema horrified that I’d arrived on a Friday night with unwashed hair and still smelling of some spag bol that I’d made earlier. But that’s what it felt like. Admittedly this is not as bad as the time many years ago when I wore hotpants to the post office on a hot summers day and, after admiring myself in many shops windows on the way, flicking my hair and smiling at my adoring public (own reflection) confidently strutted past dozens of people at a bus stop only to be hit on the forehead by a rogue potato that had bounced out of a delivery truck on its way to the chippy. You know that bit in films where the needle is abruptly ripped off the record? Yeah, that. It knocked my sunglasses off, ffs. Back in the cinema, I had two options: I could run away like the Day of Shame aka Spudgate. Or I could do what I came to do: watch a film on my own. Obviously I chose the latter because I am a confident and determined woman. And I didn’t fancy my chances of getting the Coke and popcorn back to the car without disaster. I’ve been the to pictures before on my own so this wasn’t a completely new experience but I used to go in the daytime when I worked nights, often weekday morning showings when there were few people and often others on their own. This was something different. There were groups of friends, double dates, and couples……so many couples. How naive of me to think I wouldn’t feel self conscious. I really believe that if a man goes to the cinema on his own then he looks like a film buff, whereas a female on her own just looks like she’s been stood up. No need to worry on that count though, as I had made my circumstances very well known to everyone on arrival. I’d forgotten what is was like to watch trailers on their own and have nobody to comment on them with: that Batman vs Superman looked good, ooh I’ve heard of that one, or I’d give this a miss. And the same went for the feature presentation: nobody to nudge when there’s an in-joke or you notice a cameo appearance. Before long I felt less self-conscious and more just lonely. I laughed out loud so many times, even when nobody else around me was laughing. Unfortunately for me (and everybody around me) I’ve got the worst laugh in the world which ranges from a nasal whinny to a full on dirty cackle depending on how tickled I am. This too made me feel a bit sad as I walked away; that ‘feel good’ feeling makes you feel better when it makes someone else feel good too. That said, I’d still do it again. It’s been a rough week so maybe I was feeling a bit more delicate than usual, and maybe next time I’ll choose something that I’d only want to watch by myself and maybe at a quieter time. 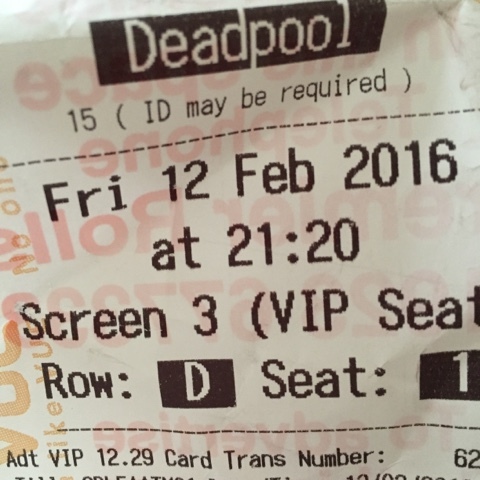 You can read my review on Deadpool here.